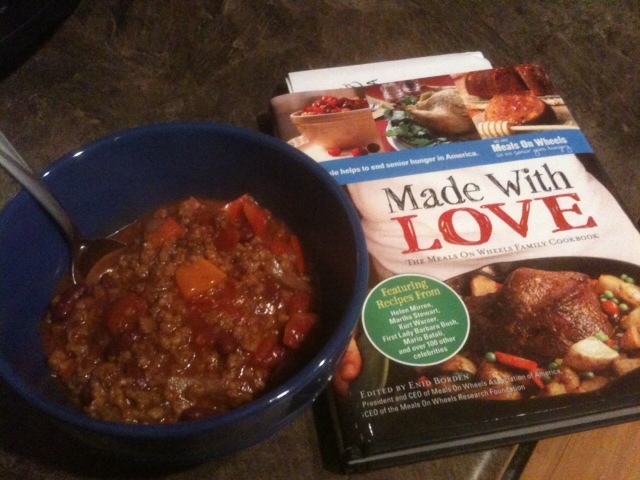 I’ve had the recent privilege to read Made with Love: The Meals on Wheels Family Cookbook. Meals on Wheels Association of America aims to help feed seniors in need every day. With celebrity contributors such as Paula Deen, Kurt Warner, and Dr. Maya Angelou, every page of this cookbook had its own personality to match an equally unique recipe. It kept my eyes reading and my mouth salivating. With the holidays here and the nights getting colder, I chose to try Phyllis Diller’s Chili. Just like Phyllis’s work as an actress, her chili recipe was full of variety and spice. This chili was so easy and fast to make, and I loved every bite. The chili can be topped with cheese and sour cream, or simply eaten on its own. I'd be interested in a vegetarian version of this chili made with non-meat crumbles instead of the ground beef for a lighter taste. Also, I did not add as much of the juices as called for; I like a thicker chili. Feel free to leave a comment of your unique chili additions or substitutions. You can follow Made with Love on Facebook and Twitter. In a large-heavy bottomed pot, warm oil over medium-high heat. Add ground beef and cook, stirring occasionally, until beef is cooked through, about 10 minutes. Add onion, bell pepper, and garlic, and cook until vegetables soften, about 3 minutes. Stir in seasonings and tomatoes, and reduce heat so mixture is at a simmer until chili begins to thicken slightly, about 20 minutes. Stir in kidney beans and their juice and simmer an additional 10 minutes. Taste to adjust seasonings, and serve. Love a good chili! Hope you'll be able to make it to Blended Conference next month! We would love to see you there!